From the time I was a young teenager, I remember always doing the dishes before I went to bed. For me, it was a time to wind down and relax. Yes, I said relax. I found (and still find) doing dishes to be very relaxing. Having my hands submerged in hot water, rinsing and putting clean dishes in the dish rack is so calming and helps me to clear my head after a long day of busyness. My husband also loves to do the dishes and recently, I was battling a nasty head cold. I found him in the kitchen after several meals, bent over the sink, scrubbing the dishes for me. What a sweet guy! I would not have complained if I had to do them myself but it was so nice of him to be so thoughtful. I am blessed! Have you ever noticed that sometimes your sponges can start smelling stinky? It happens to me all the time. I read somewhere that after doing dishes, you can pop your sponge into the microwave and run it for a minute. and that will kill bacteria. I tried it, and it worked...when I remembered to do it. The problem is, I DON'T remember to do it and so I am tossing sponges more often than I care to admit. 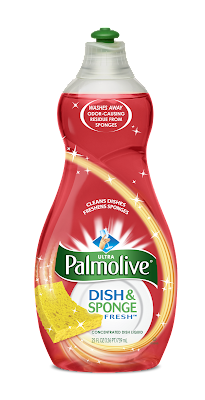 Today, I am going to tell you about a new dish soap from Palmolive that is designed to keep your sponges smelling fresh and clean!! Palmolive Dish & Sponge Fresh Dish Liquid is a brand new product that has been introduced to the market and it promises to be a dish washer's newest best friend!! Here is a bit more about a recent survey that was conducted and the subject of this survey? Stinky sponges. Read on to find out more! The new “Dirty Dishes Dilemma” survey by Palmolive® reveals that close to nine out of ten households (86%) have encountered a bad smelling sponge and almost everyone surveyed (94%) said they felt this particular odor impacts their kitchen’s cleanliness most. Luckily new Palmolive Dish & Sponge Fresh Dish Liquid will help combat this stinky sink issue by keeping dishes clean AND helping sponges stay fresh. New Palmolive Dish & Sponge Fresh Dish Liquid’s formula washes away odor causing residue on sponges and keeps them smelling fresh; while the powerful grease cutting action leaves pots, pans and plates sparkling. Like I said before, I have taken a whiff of my sponge used to CLEAN my dishes and it has been pretty smelly. So, you can imagine that I was very excited to put this detergent to the test in my own kitchen. For this review I was sent a bottle of Palmolive's brand new Dish & Sponge Fresh Dish Liquid. Palmolive has been my dish soap of choice for quite a while now and I use it regularly so I was really interested to see how this worked for me. I gave it a try tonight while doing my nightly round of dishes and I LOVE IT. It smells great. The scent is not flowery or anything like that. It smells fresh and clean. I also loved how it made great suds...to me, if I can't SEE the soap, I have a hard time believing it is there. I had some really greasy dishes to do and this new soap from Palmolive did a great job of degreasing and cleaning my dishes. Oh, and I sniffed my sponge after I was done and it smelled really nice!! My daughter loves to do dishes as well and so I let her help. She is like her mommy...she NEEDS to see soap bubbles or she will add more and more soap until she sees bubbles. Yes, we can go through LOADS of dish soap around here. :) I am happy to report that she was very satisfied with the Palmolive Dish & Sponge Fresh Dish Liquid...as you can see, her smile says it all! Palmolive Dish & Sponge Fresh Dish Liquid can be found at mass retail and grocery stores nationwide and retails for about $3.29 for a 25 ounce bottle. So, in my opinion...Palmolive Dish & Sponge Fresh Dish Liquid is wonderful! I now have a solution for stinky sponges. I love how fresh and clean my whole kitchen smells after doing my dishes now. It is not just the fact that my dishes are clean, it is the fact that even my sponges are clean! YAY! I definitely recommend this new dish soap from Palmolive to everyone! Disclaimer: I received no monetary compensation for this post. I did receive free Palmolive products for review purposes. All quotes and stock photos are from the Palmolive website and email. Prize is being provided and shipped by the sponsor. All thoughts and opinions are 100% mine. Palmolive! I love that brand. I have a bottle of Palmolive right now. I use Palmolive antibacterial soap. Right now I'm using Dawn. I am currently using Dawn. I'm using a dollar store brand right now. We're using Fairy Liquid right now. I am using Gain right now! I think I'm using Palmolive right now. I currently use Dawn because I thought it would be best...it doesn't soap up enough for me though. I have Dawn right now. I usually by Dawn, but it also depends on what's on sale.